A small group of protesters gathered on a sidewalk in downtown Anchorage Saturday morning, holding signs that read "150 DEAD DOGS AND COUNTING" and "STOP RACING DOGS TO DEATH" and "PULL YOURSELF," near the starting line of the 46th Iditarod Trail Sled Dog Race. At the protesters' feet lay five large stuffed-animal dogs, each with a rose and a poster board headstone representing the Iditarod dogs that died last year, bearing the causes of their deaths and their names: Flash, Shilling, Groovey, Deacon and Smoke. The dog funeral protest, organized by animal rights group PETA (People for the Ethical Treatment of Animals), comes at a time with the Iditarod at a crossroads and mired in controversy, both inside and outside of the race organization. 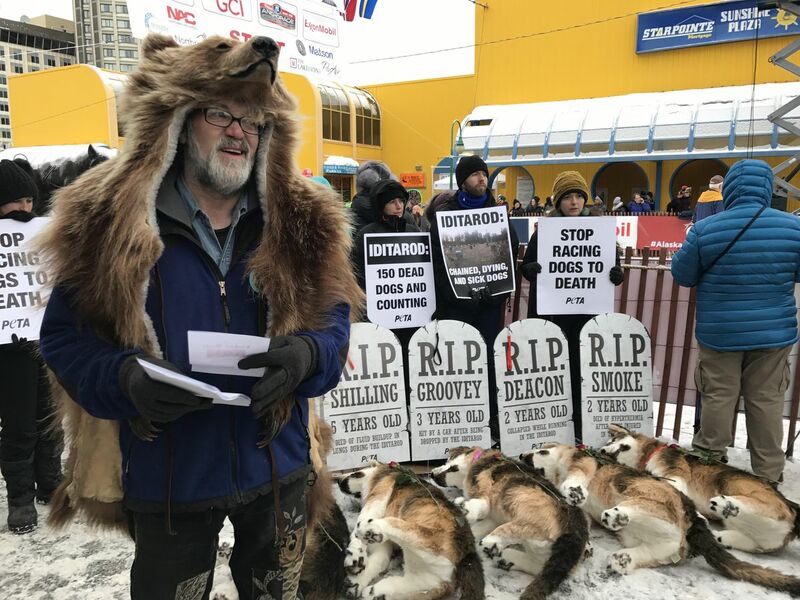 While PETA has long criticized the Iditarod and urged race sponsors to drop their support of the event, Saturday marked the first time the organization staged a protest at the race. Protest organizers said they were compelled to act after four dogs died during the 2017 Iditarod, the most since 2009. A fifth sled dog died last year when it was hit by a car after it was dropped from the race and returned to Anchorage, where it escaped from a handler's yard. Another factor for activists was the 2017 drug testing controversy involving star musher Dallas Seavey's sled dogs. "It's a really important time, we feel, to speak out against the cruel and deadly race that is the Iditarod," said Tricia Lebkuecher, a PETA campaigner based in Nashville who flew up for the event. She said the stuffed dogs were purchased from a prop supplier and brought up from Los Angeles. A reporter counted eight people demonstrating at one point in the morning and Lebkuecher said there were a dozen PETA protesters in total at the event. Most of the protesters were Alaskans, Lebkuecher said. Others flew to Alaska for the protests, including Fern Levitt, a Canadian filmmaker whose 2016 documentary "Sled Dogs," critical of the sled dog industry, sparked controversy in the mushing community. "I can't think of one species that does well living its life at the end of a chain," Levitt said. Jane Stevens, from Australia, also traveled to Anchorage for the protest. Stevens said she volunteered at the sled dog kennel of three-time Iditarod champion Mitch Seavey shortly before the 2010 Iditarod. She said she witnessed him punch and kick a dog. She filed a report with troopers. According to a copy of the report, a trooper contacted Mitch Seavey, found "no evidence of injury" and closed the case. "I was actually really shaken and I felt quite fearful at seeing that kind of force used on a small animal by a man," Stevens said. "So I got on a bus and left that very next day and didn't look back." Mitch Seavey said in an earlier interview he did not want to dignify the accusations against him with a response. He went on to say they were lies. "There's an episode where there has been a dog fight and I think that's probably what one of those ding-dongs is referring to," he said. "When you have a team full of dogs trying to tear chunks out of each other you have to do what it takes to undo the fight." Chas St. George, chief operations officer of the Iditarod Trail Committee, said Saturday that he remembered a letter from Stevens, and that while the organization has a race marshal, it does not have an investigative department. St. George also said the race welcomes people and groups that criticize it. "We've had a longstanding invitation to anyone that thinks that this is animal cruelty, to come and see it for themselves," he said. "In a way, I'm hopeful that they'll walk away from here and rethink their stand on what's humane. These dogs love what they do." The mood was generally calm around the protesters Saturday morning for the few hours they were there, though some passing by criticized the demonstration. "Are you kidding me?" said one man as he walked by the protest, to which the woman he was with replied, "Shame on them." Another man motioned to the demonstrators and referred to them as "crazy people." Local muralist Richard "Ziggy" Zeigler wore a brown bear hat and fur and stood in front of the group of protesters, handing out flyers for a sale at the Alaska Fur Gallery. A hot dog cart was set up just a few steps away. Race onlooker Sue Ward has been involved in mushing for years and was in town from Seward to watch the Iditarod start, wearing a kuspuk with wolverine fur. She said the protesters were well-intentioned but misguided. She also defended mushers, citing the lengths they go to to care for dogs. "I applaud their right to protest. But they're wrong," she said. "(The Iditarod) it's something that we're known for. To kind of make it controversial, it's always kind of — can't we just have fun?" Rachel Cummings, one of the protesters in the group organized by PETA, said that as a lifelong Alaskan, she's never supported the race. "Once you get animals in for a profit and for big events like this, they're inevitably going to be treated poorly," she said. PETA is calling for an end to the Iditarod, the animal rights organization said in a statement Tuesday. Protesters will also be at the race restart in Willow on Sunday, and at the finish line in Nome.